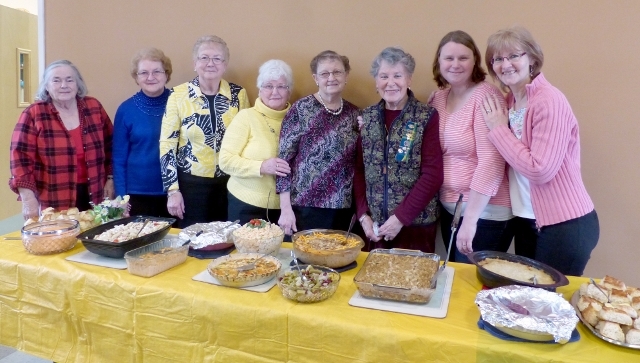 The Bailieboro Women’s Institute hosted their annual spring luncheon on Tuesday with homemade dishes, a silent auction and door prizes for the attendees. After the meal, guest speaker, Yoga instructor, provided some moves for the crowd designed to keep them feeling good physically and emotionally. Pictured from left to right are WI members Pat Wood, Thelma Sanderson, Marion Grahm, Audrey Vowles, Vilda Nurse, Joyce Syer, Yoga instructor Lisa Shawin O’Leary, and President Rita Saler. Tagged local events, local people, Millbrook. Bookmark the permalink.